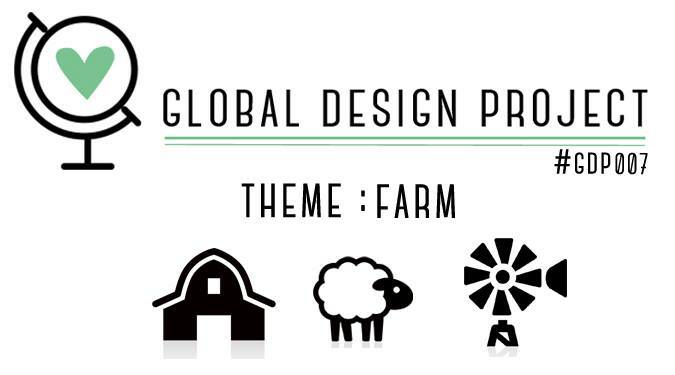 Happy Monday everybody, this week Global Design Project have a new challenge for you and the theme is: the Farm. Don't worry if you don't own a farm themed stamp set there are many things you can create with your Stampin Up supplies. To make this "Farm Fresh" eco- friendly shopping bag I have used Larger than Life Alphabet and Numbers Stamp set and Bouquet Bigz L die from Stampin' Up! this is not a sewing project. 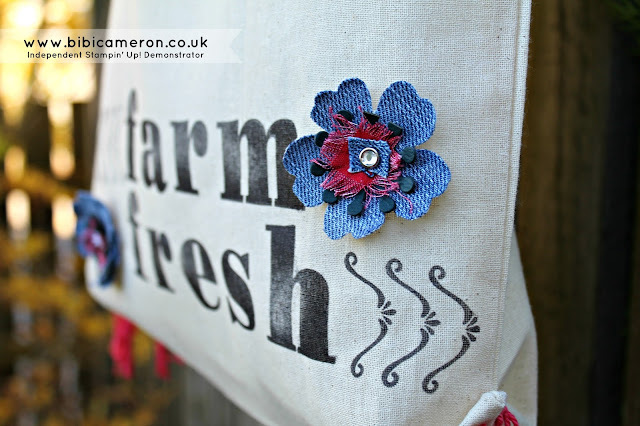 I bought the bag at 50p at a local craft shop and the denim flowers embellishments do not require sewing. This is a very affordable project and it is extremely easy and quick. Find video tutorial at the bottom of this post. 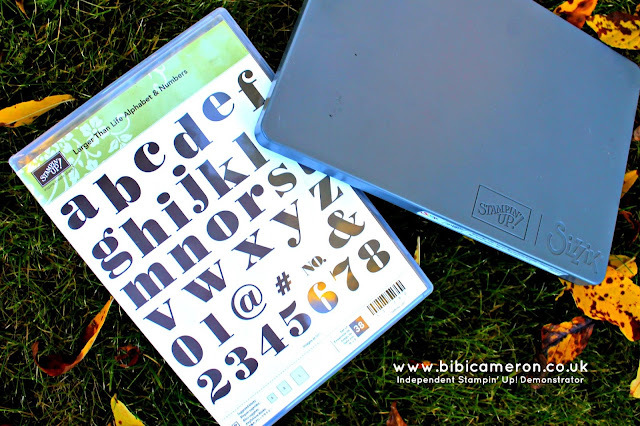 With Larger Than life Alphabet and Numbers Stamp set with 38 individual stamps you will be able to personalize any paper craft project or home decor - sewing project. you might need to use different inks and paints to achieve good and permanent results. Stampin Up inks are water based so they are not suitable for Stamping on fabric projects that need to be washed. 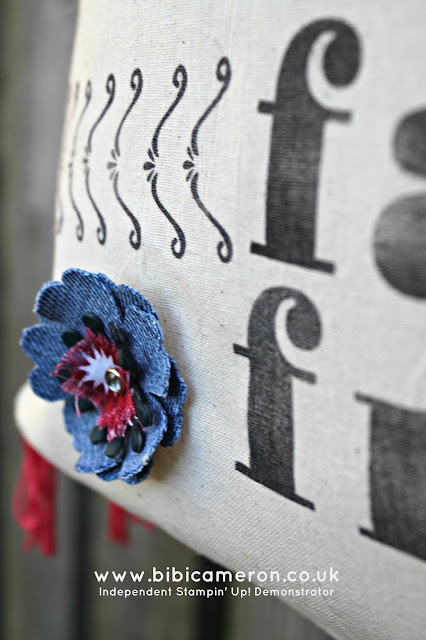 Please make a search in my blog for "Fabric" and you will find additional information about Stamping on Fabric, projects and tutorials. I also used the Bouquet Bigz L die from Stampin Up! to create some floral embellishments and I have attached them to the bag with brads. Remember: when crafting every detail matters. 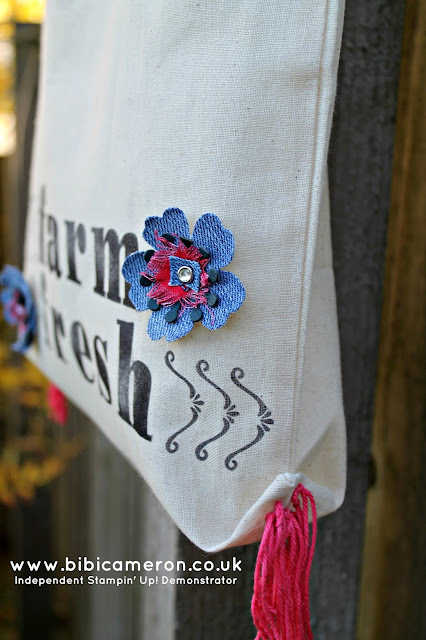 I used threads to create a fun embellishment for the bag corners. Personalized cushion covers - Stamping on fabric FAQ. Buy this amazing tools by click in in the pictures below or click here to visit my shop to discover many more beautiful craft materials. 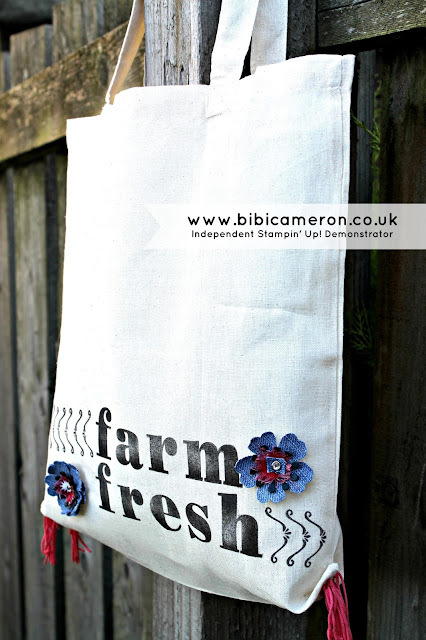 Bibi, super cute bag and perfect for our "farm" challenge this week! I love that you did a video to go with this project! I love your thinking Bibi!! Who wouldn't want to sling this bag over their shoulder to bring home all the goodies bought at the farmers market! A lovely reminder also, that we can stamp on other materials with Stampin' Up! product too! thank you Paula. You can imaging how amazing is Stampin on glass and wood as well. I was on Pinterest and saw this bag! I loved it and wanted to buy it! Then I looked closer and said "Holy crap, that is Stampin' Up! stuff!". Now I see it is YOUR work! Holy crap, I love it! Wow what an awesome project! I'd love to take this bag to the local farmers market to carry my goods! Your idea is SO great! Never thought about doing a project like this. Clever idea, clever lady. I feel like shopping at a famer's market! Cool project! Nice blog. Thanks for sharing.